In Marxist theory, socialism (also known as a socialist mode of production or lower-stage of communism) refers to a specific historical phase of economic development and its corresponding set of social relations that emerge from capitalism in the schema of historical materialism. The Marxist definition of socialism is an economic transition where the sole criterion for production is use-value and therefore the law of value no longer directs economic activity. Marxist production for use is coordinated through conscious economic planning, while distribution of products is based on the principle of to each according to his contribution. The social relations of socialism are characterized by the proletariat effectively controlling the means of production, either through cooperative enterprises or by public ownership or private artisanal tools and self-management, so that social surplus goes to the working class, and hence society as a whole. Karl Marx himself did not use the term "socialism" to refer to this development, but rather called it a communist society that has not yet reached its "higher-stage." The term "socialism" (in reference to this societal organization) was popularized during the Russian Revolution by Vladimir Lenin. What we have to deal with here is a communist society, not as it has developed on its own foundations, but, on the contrary, just as it emerges from capitalist society; which is thus in every respect, economically, morally, and intellectually, still stamped with the birthmarks of the old society from whose womb it emerges. Accordingly, the individual producer receives back from society – after the deductions have been made – exactly what he gives to it. What he has given to it is his individual quantum of labor. For example, the social working day consists of the sum of the individual hours of work; the individual labor time of the individual producer is the part of the social working day contributed by him, his share in it. He receives a certificate from society that he has furnished such-and-such an amount of labor (after deducting his labor for the common funds); and with this certificate, he draws from the social stock of means of consumption as much as the same amount of labor cost. The same amount of labor which he has given to society in one form, he receives back in another. Socialism is a post-commodity economic system, meaning that production is carried out to directly produce use-value (to directly satisfy human needs, or economic demands) as opposed to being produced with a view to generating a profit. The stage in which the accumulation of capital was viable and effective is rendered insufficient at the socialist stage of social and economic development, leading to a situation where production is carried out independently of capital accumulation in a supposedly planned fashion. However, there have been other conceptions of economic planning, including decentralized-planning and participatory planning. Marx' main manuscript, a postum work is called 'Grundrisse' was published in 1953. In this work, most areas of Marx' thinking output are explored: production, consumption, distribution, social impact of capitalism, communism as the next level after capitalism as a live model for humans emphasizing fair distribution of goods, equality and the optimum environment for humans to live in to develop themselves to their best capabilities (art, politics, philosophy) in order to achieve happiness and to satisfy intrinsic needs (whatever they may be). The goal of Marx was to design a social system which eliminates the differences in classes between the poor (proletarians) and the rich (bourgeoise). By achieving this elimination, the tension and the power differences are gone to force the workers to work under bad conditions with way too low salaries (loans). Capitalism was, according Marx, a system which was guarateed to lead to a secured downfall because big companies will buy small companies leading to monopolism, so there will be a very small population owning all the money (and power) and there will be a huge number of people having no money and therefore no potential to buy products from the capitalistic production system. For sure a revolution would happen. What Marx' oversaw was that the loanworkers were paid as such that they were and still are able to buy products from the capitalistic production system, in other words, the workers became as essential part to assure the capitalistic system is still alive and dominant in most of world's nations. Socialism would make use of incentive-based systems, and inequality would still exist but to a diminishing extent as all members of society would be worker-owners. This eliminates the severity of previous tendencies towards inequality and conflicts arising over ownership of the means of production and property income accruing to a small class of owners. The method of compensation and reward in a socialist society would be based on an authentic meritocracy, along the principle of "from each according to his ability, to each according to his contribution". As a set of social relationships, socialism is defined by the degree to which economic activity in society is planned by the associated producers so that the surplus product produced by socialized assets is controlled by a majority of the population through democratic processes. The sale of labor power would be abolished so that every individual participates in running their institution as stakeholders or members with no one having coercive power over anyone else in a vertical social division of labor (which is to be distinguished from a non-social, technical division of labor which would still exist in socialism). The incentive structure changes in a socialist society given the change in the social environment, so that an individual laborers' work becomes increasingly autonomous and creative, creating a sense of responsibility for his or her institution as a stakeholder. In Marxist theory, the state is "the institution of organized violence which is used by the ruling class of a country to maintain the conditions of its rule. Thus, it is only in a society which is divided between hostile social classes that the state exists." The state is thus seen as a mechanism that is dominated by the interests of the ruling class and utilized to subjugate other classes in order to protect and legitimize the existing economic system. ^ Marx, Karl. Critique of the Gotha Programme. Retrieved 8 March 2019. ^ "Socialism". Glossary of Terms. Marxism.org. Retrieved 20 February 2013. ^ Gasper, Phillip (October 2005). The Communist Manifesto: a road map to history's most important political document. Haymarket Books. p. 23. ISBN 978-1-931859-25-7. Marx and Engels never speculated on the detailed organization of a future socialist or communist society. The key task for them was building a movement to overthrow capitalism. If and when that movement was successful, it would be up to the members of the new society to decide democratically how it was to be organized, in the concrete historical circumstances in which they found themselves. ^ Market Socialism: The Debate Among Socialists, by Schweickart, David; Lawler, James; Ticktin, Hillel; Ollman, Bertell. 1998. From "The Difference Between Marxism and Market Socialism" (P.61-63): "More fundamentally, a socialist society must be one in which the economy is run on the principle of the direct satisfaction of human needs...Exchange-value, prices and so money are goals in themselves in a capitalist society or in any market. There is no necessary connection between the accumulation of capital or sums of money and human welfare. Under conditions of backwardness, the spur of money and the accumulation of wealth has led to a massive growth in industry and technology...It seems an odd argument to say that a capitalist will only be efficient in producing use-value of a good quality when trying to make more money than the next capitalist. It would seem easier to rely on the planning of use-values in a rational way, which because there is no duplication, would be produced more cheaply and be of a higher quality." ^ SCARLETT. "Karl Marx Socialism and Scientific Communism". EconomicTheories.org. Retrieved 20 February 2013. ^ Karl Marx - Critique of the Gotha Programme. 1875 Full Text. Part 1: "In a higher phase of communist society, after the enslaving subordination of the individual to the division of labor, and therewith also the antithesis between mental and physical labor, has vanished; after labor has become not only a means of life but life's prime want; after the productive forces have also increased with the all-around development of the individual, and all the springs of co-operative wealth flow more abundantly -- only then can the narrow horizon of bourgeois right be crossed in its entirety and society inscribe on its banners: From each according to his ability, to each according to his needs!" ^ Erich Fromm (1961). "Marx's Concept Of Socialism". Marx's Concept of Man. Frederick Ungar Publishing. Retrieved 20 February 2013. ^ Market Socialism: The Debate Among Socialists, by Schweickart, David; Lawler, James; Ticktin, Hillel; Ollman, Bertell. 1998. From "Definitions of market and socialism" (pp. 58–59): "For an Anti-Stalinist Marxist, socialism is defined by the degree to which the society is planned. Planning here is understood as the conscious regulation of society by the associated producers themselves. Put it differently, the control over the surplus product rests with the majority of the population through a resolutely democratic process...The sale of labor power is abolished and labor necessarily becomes creative. Everyone participates in running their institutions and society as a whole. No one controls anyone else." ^ "State". 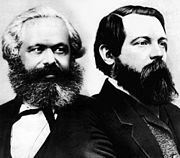 Marxism.org Glossary of Terms. Marxism.org. Retrieved 20 February 2013. ^ Socialism: Utopian and Scientific, on Marxists.org: http://www.marxists.org/archive/marx/works/1880/soc-utop/ch01.htm: "In 1816, he declares that politics is the science of production, and foretells the complete absorption of politics by economics. The knowledge that economic conditions are the basis of political institutions appears here only in embryo. Yet what is here already very plainly expressed is the idea of the future conversion of political rule over men into an administration of things and a direction of processes of production."